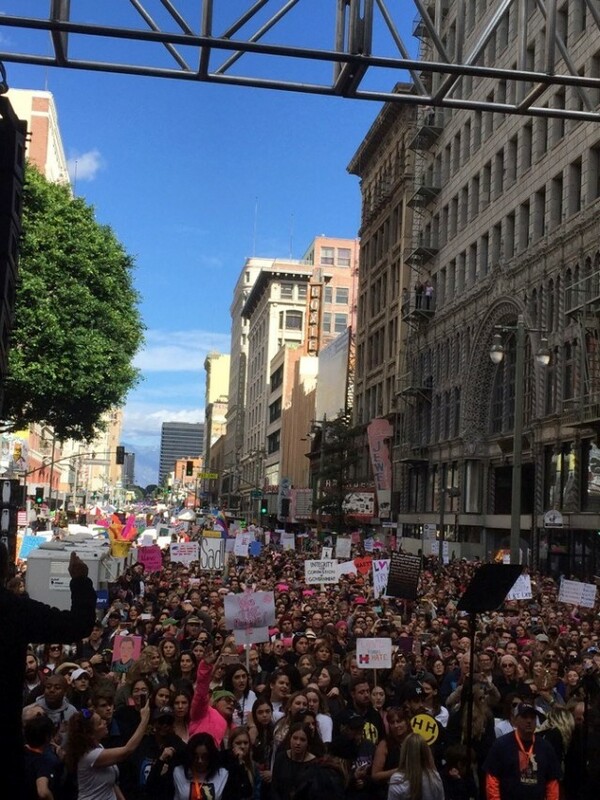 I marched in Los Angeles Saturday where we were told there were as many as 750,000 people. It felt like it. I can’t prove it but when I stood on the stage to speak there were masses of people as far as the eye could see and that didn’t even include the masses who filled all the side streets and were out of sight. It was awesome to be among so many people, all supporting each other, no pushing or negativity and the signs and banners were diving and original. Don’t let anyone write this off as some liberal elite event. There were significant marches in all 50 states, and on every continent! Millions came together in peace, and pledging solidarity. I was thrilled that our march featured many city officials as participants. Rather than flanking the streets with police in riot gear Eric Garcetti, our Mayor spoke in front of a City Hall draped in American flags. There were two stages set up. One at City Hall another a few blocks away on Hill Street. 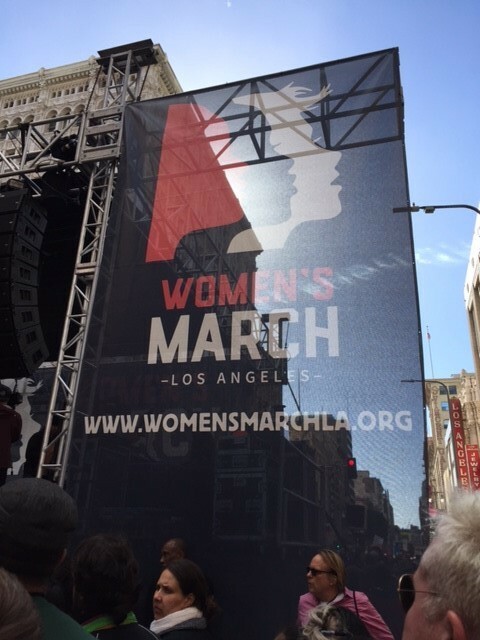 We marched Starting at Pershing Square from 10am until 12pm snaking, weaving shoulder to shoulder through downtown Los Angeles. People were still arriving when I took the stage around 1PM at Hill Street. The Metros were filled to capacity. I’m told passengers in Hollywood had to head on the North bound trains and ride the entire route in order to make it downtown. Some stations ran out of tickets to sell and some of the stations stations opened the turnstiles and let passengers ride for free. Traffic in some areas was a complete standstill. It was quite a crowd, but if everyone who wanted to come could’ve gotten there we probably would’ve been over a million people. It was so nice to see men in the march as well as millennials and young children. It really spanned a wide range of sexes, ages and ethnicities. A Troupe of Muslim dancers were preparing to perform. I marched with many women friends and my son and daughter-in- law. I always feel better, safer when they are close. And I hugged James Franco. I think he’s such a brave, original talent across a lot of disciplines. I was so glad he was there. As was Barbra Streisand, Kerry Washington, Miley Cyrus, Jackson Brown and so many more. 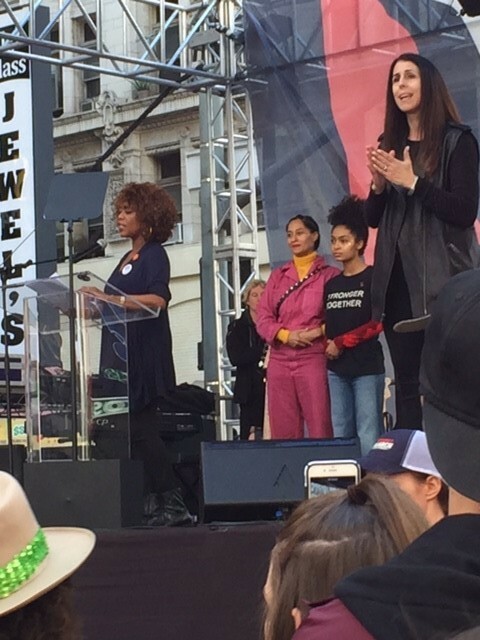 Natalie Portman, far into a pregnancy, gave a terrific speech about how awesome and mysterious women’s bodies are and that a mostly white, male government should not be allowed to tell a woman what she can or can’t do with her body. She said that such a monoculture government was a problem, calling it “taxation without representation.” Alfre Woodard read a poem called “Sweet Honey in the Rock” and boy did she rock it! In my remarks I emphasized the importance of refusing to normalize or legitimize him. Fake news, false promises and foreign interference in our election renders his election illegitimate. I said that on the national level, we need to play defense– systematically resisting, disrupting and blocking the Predator-in-Chiefs every attempt to roll back our democratic rights and freedoms. On state and local levels we must be on the offense: training and supporting organizers who need to be out in our communities for the next 4 years and beyond, bringing people together behind a shared vision of true Democracy–political, social and economic–that everyone can see themselves reflected in. We need to build an intersectional Movement of movements. We need to identify and groom righteous women to run for office–school boards, county commissioners, city councils, state legislatures. We must work locally to take back our government where we live. State governments will, more and more, be determining much that affects our federal policies and thus our lives. I called for an end to policies that maintain the Wall Street centered economic status quo that enriches the few and deeply harms working people and the poor and the middle class. And like all the other speakers I called for solidarity across race and class. It was a good day, and uplifting, hopeful day. There has to be many more like these. We can’t stop. We can’t stand down we must rise up and resist — don’t agonize, organize! This could very well be the start of something. 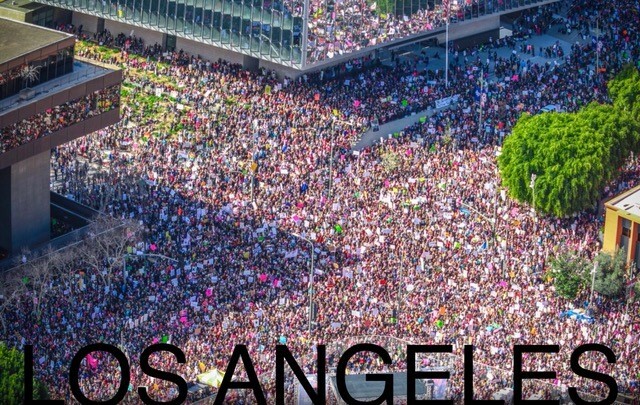 Women are going to continue to organize visit womensmarchla.org for updates. My son wearing a “Supreme” Tshirt with yours truly. 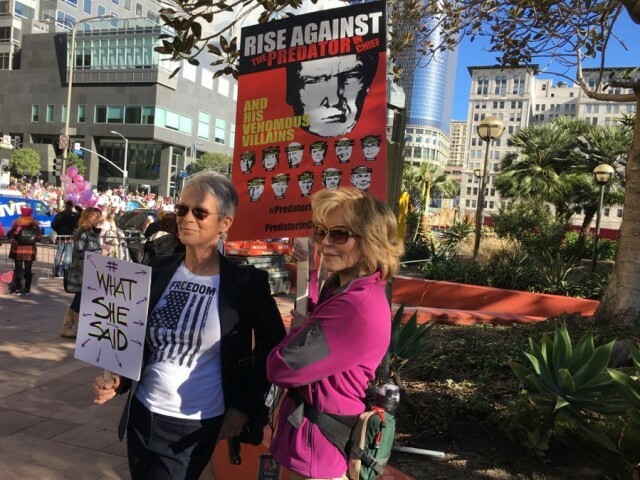 Before the March with Jamie Lee Curtis. A friend emailed me this photo, wish I could have run into this man. The view from the stage on Hill Street. With Juliette Lewis who sang a rousing rendition of U2s “In the Name of Love” with the Edge. 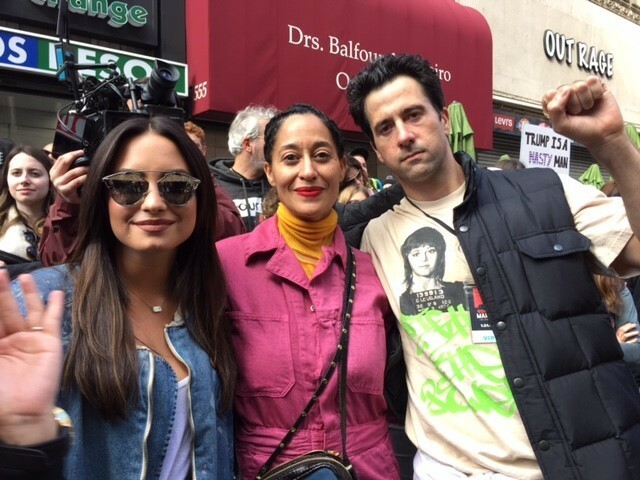 Demi Lavato, Tracee Ellis Ross, and Troy Garity. I’m so proud of everyone that marched and so peacefully expressed our freedoms, our basic beliefs in our human rights. This is the movement our ladies of passion began so long ago with the suffrage marches with so many ideals still needing to be expressed. I solute the woman and families that stand up and voice the concerns for all groups minored in this day in age. We live in a great America where women and liberal progressive thinkers who make things happen. Thank you Jane. You are loved and admired. Never change. Hussien, yes, the organizing part has already begun. You will learn more. Where do you live? I live in Colorado — the protests there were impressive. Was glad to partake. More to the point I made, it seems Trump is hellbent on approving Keystone and DAPL. It’s terrible. Perhaps, something extraordinary will be the ultimate result of a large segment of our country feeling marginalized. We are witnessing the masses gather, in support of each other’s rights, regardless of gender, race, ethnicity, sexual orientation, religion, or class. I am proponent of societal equality, and as a result, I have spoken in front of my state senate, on behalf of women and minorities. Along the way, I have begged anyone who would listen to unite, and become a voice which can no longer be ignored. Little did I know that the event, which would unite us all, was right around the corner. We have coalesced, into a wonderful and peaceful group, who are demanding equality. Thank you, Ms. Fonda, for always acting with a beautiful conscience, and leading the way for all of us. I saw you on Bill Maher the night before the march and you looked like everyone else who supported the only candidate who was qualified to be President, Hillary Clinton. You just seemed to be still in shock and the fact that clown is officially President makes me so depressed I sometimes think I am having a nightmare. I hope this march is the beginning of something huge. I don’t believe for one minute he won the electoral votes fair an d square. I just can’t figure it out but SOMETHING IS WRONG and this man is not legitimate. Nothing makes sense. I’m glad I’m not the only one who feels so low. Trump can’t even pass an opportunity to blast Meryl Streep. His hypocracy is astounding and the fact that he bullied, lied, and did everything wrong makes this a lesson that can’t be logically figured out. 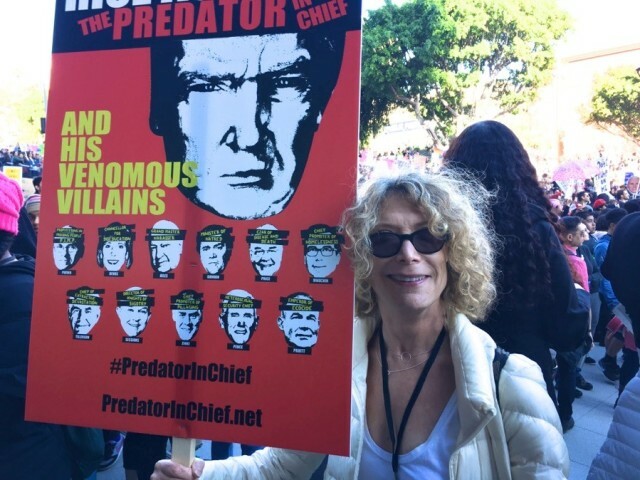 “Predator in Chief” is fantastic! Has Trump said anything against you? I’m sure your turn will come. If he does, it means you got under his skin and we can’t stop until he is ran out of town. And you do encourage and groom women to have the courage to be involved and run for office! FUNNY,,, NEVERTHELESS ,, AFTER THE GYM I EXPERIENCED THE PEACE IN MY COMMUNITY FOR I LIVE RIGHT ON 6TH AND SPRING AS A MATTER OF FACT THAT STAGE WAS PRACTICALLY NEAR MY SUITE,, SO YES I WAS CAUGHT UP IN THE CROWD BUT A NICE CAUGHT UP BECAUSE I GOT TO SEE U2 AND NATALIE PORTMAN AND DEBBIE ALLEN,, AND I CALLED FOR THE POLICE SHOWED MY LICENSE ,,AND TO GET TO MY HOME,,, ,, WOW GOT HOME WITH NO SWEAT ,, MUST OF PROBABLY WALKED PASSED YOU NEVER EVEN KNOWING IT,, ANYWAY YES LATER I BROKE OUT MY BATMAN GUITAR AROUND 6PM AND WALED IT ,, ON SPRING AND BROADWAY AND MADE A FEW BUCKS AT THAT! SEE YOU AROUND JANE! It was amazing to see all of the marches across the world. My mother and I traveled on bus from Michigan to Washington DC to participate in the Women’s March there. What an incredibly inspiring experience! Thank you for being a part of it. Let’s keep moving forward! Ever so proud of being a woman theses days! God bless! Hi Jane, I marched in Lexington, KY and even though our numbers weren’t nearly as large as your march in LA, it was an unbelievable crowd that seemed to grow and grow. I don’t think I can describe in mere words how awesome it was, but you know because you were there, too! Amazing! Some friends of mine are organizing more ways we can continue to make a difference. We are gathering on Saturday to write postcards to send to our representatives in Congress and after that…who knows. But one thing’s for sure…this is only to the beginning! Thank you for all the marches, gatherings, discussions on important environmental and human issues that you participate in, and all of the actions that you have done and continue to do during your lifetime. I have greatly appreciated your time and sincere, mindful efforts to make a positive contribution to our world. In reading some of the comments regarding Alberta, I am surprised by the apparent anger directed toward your comments, and I hope that all of those who care about their local region of the earth, can join together in their efforts to make changes that bring the planet to a sustainable, healthier place – beginning with our own lives, and piece of the planet we live with, but realizing that all locations in our world are connected on one planet – that rotates in a solar system in a Universe. I applaud and support the love and care, and authenticity, and pragmatic actions that you engage in, as well as your time and generosity to provide links and info on how we can also get involved to participate – if we choose to do so. I took the Saturday off, so that I could participate in our local march in Santa Cruz, CA. 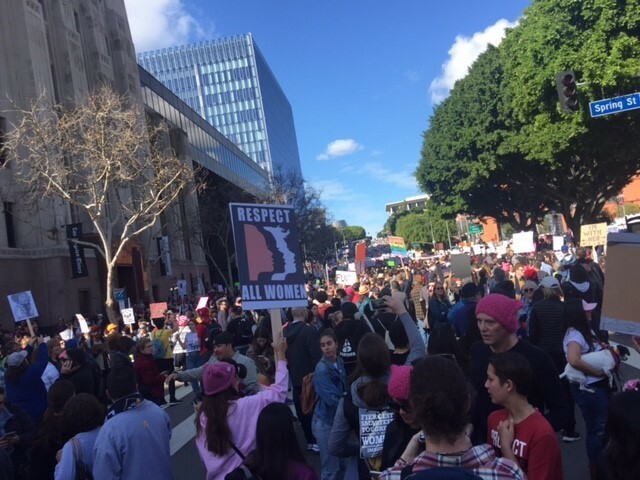 It was so wonderful to see the other thousands of people that were there, many with creative signs, pink hats, music and dancing, and tremendous support. Later, finding out how many millions of people who participated worldwide – it was an awesome feeling knowing that so many people cared about women and human rights. I also have enjoyed the links of how to contact our local state and senator representatives to stay engaged in the political process. I have not been as politically involved in the past – reaching out to contact my local politicians, etc – but I hope to be more involved in our future – as I am greatly concerned about our environment and world, for our lifetimes, as well as the lifetimes of future generations of humans and other living things (such as our living, breathing planet Earth). Happy Belated Birthday. My birthday was at the beginning of January, so every January I make a couple of New Year’s resolutions. One of mine is to be more Vigilant – in my own personal life, but also in local/national/international news and politics. I like that you recently wrote a letter to Wells Fargo. i also have done some of my banking there, so I may decide to move some of my funds to another bank. I do believe that we “vote with our dollars”, and want to become better informed, of how I can spend more consciously, and put some of my efforts and spending habits toward companies that are making positive contributions to a more sustainable, healthier world. I am currently involved in the direct healthcare of people, so I do my best each working day, to try to contribute to the health of some people, to the best of my abilities, and I feel very honored to do so. I wish you peace and Many Blessings and Joys and much success in all of the many diverse projects that you are involved with. From all of the books that I have read of yours over the years, to the couple of times I have had the delight of meeting you face to face, I am very impressed with your authenticity, generosity, bright sparkling mind and smile, and soulful, perceptive eyes. Your spirit is amazing and magnificent, and we are so fortunate that you are in our world, and live in it with such great Care for it and us. 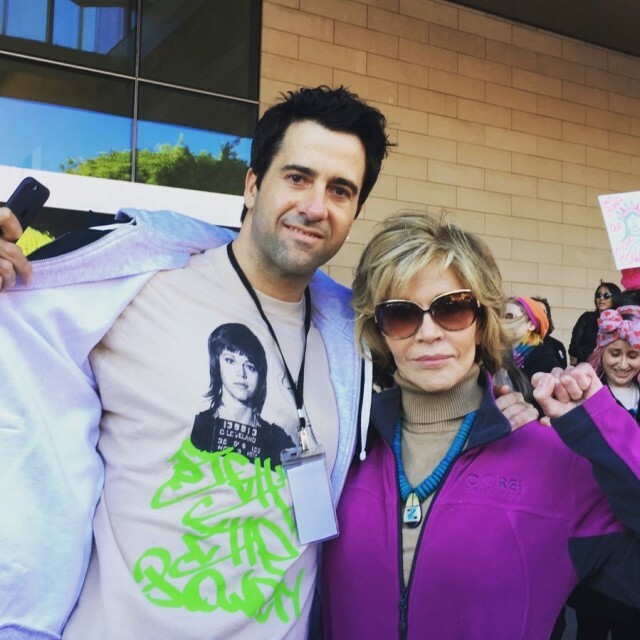 Thank You, Thank You, Thank YOU Jane Fonda. This both inspires me and puts me in awe — yes, that would be the word — and opens up such a deep and profound feeling of gratitude in my heart and mind. We desperately need more women in the House and Senate. We got some more in, in this past election, but not enough. However, the tide has turned: each time there will be more and more and more. Trump and his assembled crew of odd individuals (not leaders) — more intent on going backwards than forwards — cannot block the future. Their lack of imagination and vision and compassion doesn’t dim my heart: it sickens my stomach, but it doesn’t cloud my heart or mind. They may “try” to rewrite a lot of things, but it won’t work. What they do can be undone — and, more importantly, healed and changed. The fantastic thing about this march last Saturday was that it does help me to solidify a vision in my heart of the future I want and know is coming. During this past election, I felt hope walk out the door many times. 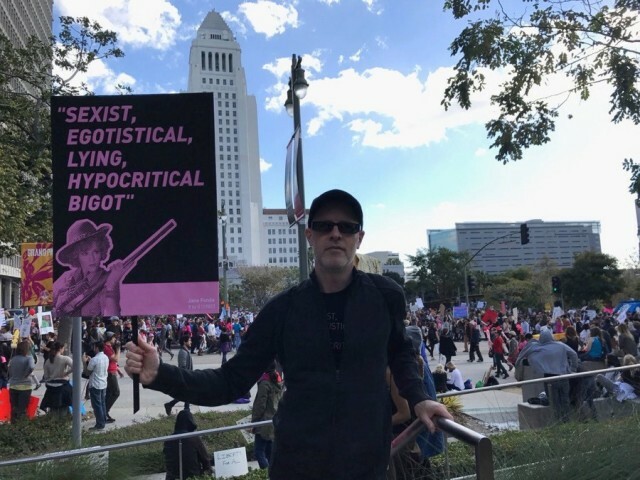 However, with this march last Saturday, I felt hope come bursting back in to let me know that my intuition about a diverse and inclusive world is right on target. It also reminded me that change can come from love and kindness and a sense of belonging. Thank you for sharing! We have to stop the Donald! The sign “WHAT SHE SAID” says it all: women unable to think for themselves. I love you Jane, grew up with you. And I’d always thought you were against the Vietnam war and felt bad for the flack you took. I guess I need to revisit that now based on your current opinions. Please consider opening your mind, do some reading and step away from the herd thinking. That is AWESOME Jane! I only wish that I lived in LA so that I could have been there! THANKS AGAIN JANE for all you do! This American is a work in progress. The Invigorator is Donald J. Trump. The Resistance to The Invigorator is a rapidly growing diverse passionate fired up movement of patriots. 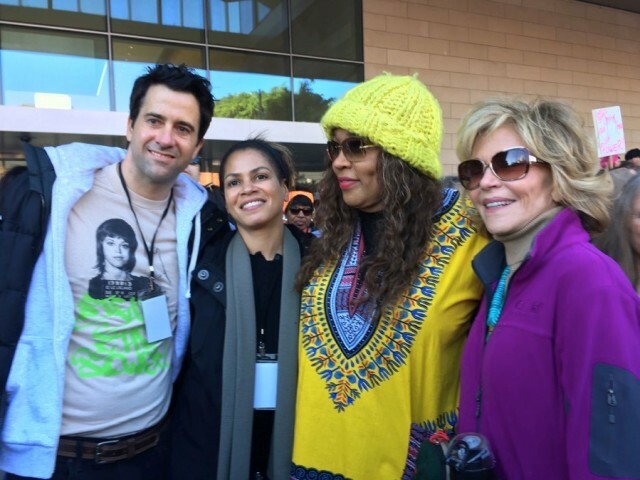 The Women’s March on Washington has united and galvanized patriotic Americans over a platform of principles calling for a broad range of reforms addressing gender, racial and economic inequality. It supports paid family leave, access to affordable reproductive health care including contraception and abortion, a living minimum wage, immigration reform with a path to citizenship, protection of the environment and public lands and the end of the use of military weapons and tactics by the police in minority communities. Most of these issues were included in the platform adopted by the Democratic National Committee last July. Michael Moore called out for the dire need for we the people to run for public office…. In 2012 I ran as a very independent candidate of Conscience for US HOUSE D.5, Fl. The article “Media, Trump and a Moral Compass” was inspired by Trump’s January 11 News Conference. He said: “I recommend people that have some moral compass. I don’t recommend reforms”, when asked how he would reform the news media. As little but REAL MEDIA, I am driven by a moral compass of compassion and truth based on experience and research. On April 12, 1963, while Martin Luther King was in the Birmingham jail because of his desegregation demonstrations, eight prominent Alabama clergymen published a statement in the local newspapers urging blacks to withdraw their support from Martin Luther King and his demonstrations. I have taken a few liberties with Reverend King’s masterpiece, added a few words of mine in BOLD and offered it as seeds for a Citizens of Conscience Manifesto in my run for US HOUSE in 2012. THANK YOU again for giving me voice on the verge of my 63rd BD just after reading that “Moments after signing an executive order to push forward the intensely disputed Dakota Access pipeline, President Donald Trump ignored a reporter’s question about Native American protesters who have fiercely opposed the project. “Mr. Trump, any comment to the Standing Rock community and the protesters out there?” a reporter in the Oval Office asked Trump after he finished signing five executive orders. Trump put his head down, pouted and looked in the opposite direction. He then responded to a question about when he expected to make a Supreme Court nomination. thank you for all that you do for humanity. i have been motivated by these marches to get involved! Thank you Jane for all you do and will do. I watched you on Bill Maher and completely agree we cannot sit back and, hope for the best, the next 4 years. As you said and believe, that is a mistake we cannot afford environmentally and personally. I happened to be in Vancouver BC, and marched with Canadians on Saturday. They too are very concerned what the new presidential regime will convey. I am from Oregon and like so many Americans we need and want to do more. What practical advice do you have for us? Where can we go from here to try and not only navigate, but obstruct the impending impact from what is most definitely ahead? I marched in NYC alongside my good friend and her 6 year-old son. The energy, the empowerment, the entire atmosphere was nothing but positive. I have never experienced anything like it in my life. Knowledge is power. March on, ladies. Fight on. But I took te chance to register her because – I saw your talk with Bill Maher, it was the most powerful statement about DT I ever heard. And it raised in new levels – because it was you, dear mrs. Jane, who saied it. and then I read some news that you are singel new – because you are “too active”- thats what the artiqle saied. I just want to say – you are absolutely great, not only because you are icon- but because you live iconically every day. It gives so much to see you looking fantastic, beautiful, elegant and young! Don`t stop! You have enormous moral power. America needs all the help it can get. Dear Margit, I don’t know if you are still reading here but I am curious what is happening in Norway. Are there marches too? How is the political climate? I heard a norway bank has divested DAPL. For many many years my wife and I visited Norway. So impressed by the nature!!! First off, thank you for inspiring Meryl’s AMAZING speech at the Golden Globes and for using your platform for years to create change. I just returned from DC last night – AMAZING, AMAZING, OVERWHELMING – so much so that we literally couldn’t march! I am closing all of my Chase accounts tomorrow and moving to First Entertainment Federal Credit Union! %$##@@! EM! Dear Jane, a big hug for being so active!! I am Standing with Standing Rock and all Americans who are fighting for human rights and Mother Earth. You are one of my sheroes. Another one ist LaDonna. LaDonna is inviting people to come or come back again. The Sacred Stone Camp is on her own land. I hope praying, divesting and taking influence on the government is enough. But I am not sure. Another video about the problems at Standing Rock Camp. How inspiring… And mind you Jane, there was a Women’s March in Budapest as well! This issue goes way beyond the US – this “predator-in-chief” as you so brilliantly said on Bill Maher is a threat to our whole world order. All we can do as take action individually, as you said, to make sure this world remains safe for every individual. Don’t even start me on the cynicism of that picture of seven men signing a bill on women’s rights – the worst kind of patriarchy returning, one that we thought was gone. That being said, the people voting for this ex reality show celebrity will be surely disappointed, but I hope we won’t get to a “We told you so.” I feel like the whole rhetoric of both sides (!) lead up to this horrifying point. So, as you said, people should unite in this knowledge. I consider the Oscar nominations an important act of step towards this, I was so happy that we saw a diverse set of nominees without much fuss. 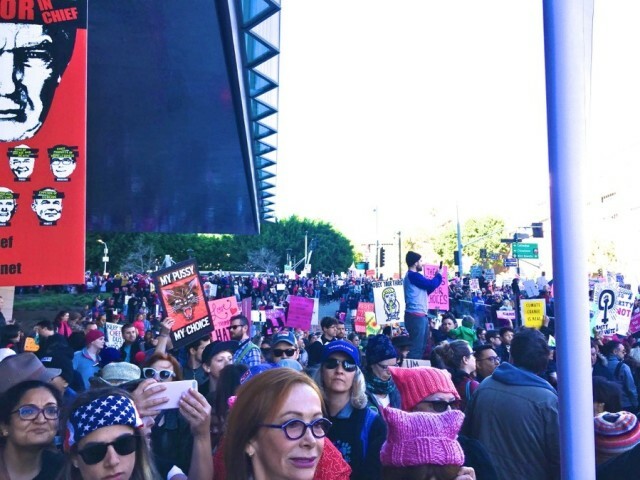 I’m inspired by Isabelle Huppert’s Golden Globes speech when she said “Do not expect cinema to set up walls and borders”… I’m not a political person in a way that I rarely attend marches, I believe in the power of cinema (or what one considers important) or expressing what I feel by my everyday actions. The masses marching the streets in so many cities and so many countries was incredibly moving and encouraging, as were the motivating words and even more the sense of dignity held by each who participated; especially for one who was around to experience the activism of the 60’s and its incredible effect on the consciousness and affairs of the time. But if were are to be successful in the next coming weeks, months and years at bringing about the change that needs to occur at so many levels, we must establish a foundational approach that will allow us to attain our goals, and at the base of that foundation should be the simple truth that we are all human. From our singular point of identity as human, we automatically bypass any sense of the “fallacy of us against them” for it establishes the truth of our connection as one shared humanity. Subsequently, every issue becomes a human issue. Every challenge, simply that of humans speaking out against and removing anything that is harmful to us as individuals and to the collective whole. It is said there is strength in numbers – and there is no greater number than the sum of our humanity. Moreover, it is with the collective strength of our numbers that we will solve all of the challenges facing humankind. I am putting the finishing touches on a book entitled “hu•man•u•ni•ty” that outlines this approach in great detail. Given the current state of world affairs, hopefully it will provide a healing and unifying perspective that can serve as the foundation for the change that must occur if we are to continue to rise upwards. I’m very much in awe of madonna and her resolute reassuring words. Keep the faith and don’t roll over..very proud of all. In a very conservative corner of Texas we had 750 march and I canny tell how shocked I was but also proud. Jane, this certainly isn’t your first time at the rodeo and I’m THRILLED to see you in the trenches, adding your experience and the considerable weight of your celebrity, to what is the must crucial battle of our lives! Is it too late in January to say happy new year? I hope you are well! By way of brief introduction, I’m 29, a model, writer, luxury travel agent and bon vivant. I’m a lover of classic cinema, and I loved your role as Kitty in “Walk On The Wild Side” alongside Capucine and Barbara Stanwyck, two of my favorites. I’m thrilled that you have opened up this forum so that you can communicate directly with those who admire you and your work. 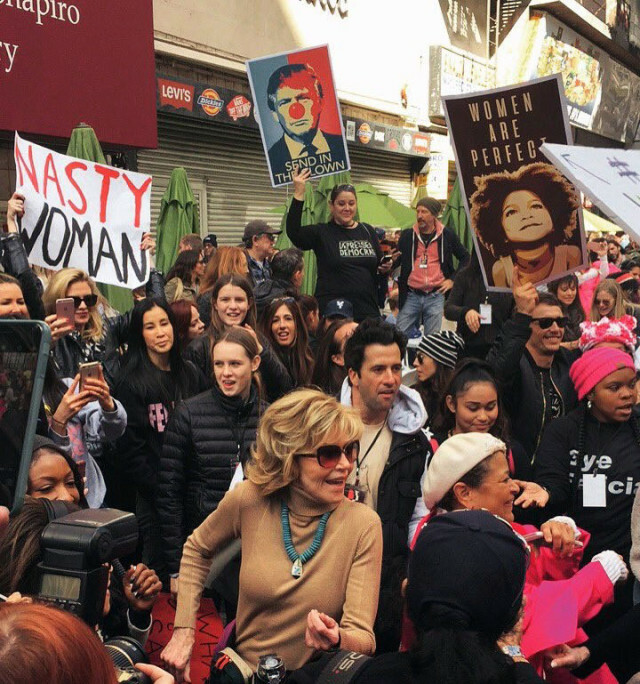 I attended the New York chapter of the Women’s March last Saturday and while it was far from perfect, it was a moving experience with plenty of provocative signs. I suspect, and I think you’ll agree, that there will be a great deal more protests during Trump’s presidency. He is a narcissist on a grand scale and a national embarrassment. What kind of a person would engage in a Twitter war with the cast of a Broadway show? And that’s not even the worst of what he’s done. Nobody is immune to criticism….except Trump. It would be comical were it not so tragic. I find that for the sake of my peace of mind, I have to disengage sometimes from the news and social media. Do you do that sometimes as well? It would be great to hear from you and who knows, maybe I’ll see you at a future New York protest. She must have been working very hard and there is a already a site where we can donate. Anyway, this time around, we are on the same side. Goodmorning everyone! Yesterday I went to bed with tears in my eyes because of the people detained at the airports. This morning happy tears because of the good news they were released! Jordan from TYT politics is back at Standing Rock. Our next march is coming. The Women’s March Netherlands tries to get together on an international level but it isn’t always possible. Dutch people aren’t going on the streets for Trump’s taxreturns. I hope the womens movement will become international and not just about american issues. Trump could be THE wake up call for the whole world, if WE want so! Just remembered, today is the Awardparty for Lily. Have fun Jane!!!! O Jane, you were ill. How sad. Just saw Lily’s speech. Heartwarming and funny as ever! My thoughts are with you. Get well soon! This is so awful. It is really hard to hear and read the bad news about what is happening in America every day. New bad news for everyone who has been at Standing Rock. You were there for a few days I think Jane, but get yourself tested too!!! So grateful the UN was at Standing Rock gathering all the evidence of violence against the protectors and also with expertise about chemical warfare. If hatred and greed in this world would immediately end by 10 people giving their lives, I would volunteer. And I now I am not alone. But it is not that easy. It is a lifetime struggle trying to be decent, not giving up on being human and holding on to the deep love for all human beings, all living creatures, for mother earth. I just heard that you are sick from Lily. All of that protesting can really have an effect on your throat. I hope you feel better soon! The promised land M.L. King was speaking about I never saw. Now I do. I see Nazi Germany and the promised land at the same time. We can go left, we can go right. It is up to us. Every day I meditate and pray for our world and for some people who are leading or ill and a few days ago I suddenly saw light coming through one person I was praying for. Quite surprised me. And than I beame aware that the body and the personality of the person is just a viel. It is all about the light that is coming through. So I can pay attention to the body and the personality in front AND I can look at the wunderful light that is coming through. It is just about changing focuse. What about the world? I see a lot of suffering. I see the risk that everything can become worse when we don’t care about this. AND I see the great possibilty that something better can come through. A world more about standing together, caring about eachother. I don’t “believe” what I have seen, I don’t say it is nonsense. But I do hope that keeping focused on that light I saw (and see) in you and you and you….and keeping focused on the promised land will change something. For a start in me. Because it is hard to hear the bad news everyday and not getting negative or depressed. Being an activist helps but it cannot be the answer all the time. Concentrating on the light and the promised land is a way to keep open hearted and positive as well. And it is about knowing that it is not about me. “I” am just the veil trying to step aside and let the light come through. Not knowing what will happen next. Love you all! Every time happy when I get in here…..yes I AM human 😀 and not a roboter. Dear Jane, I see a lot of haters on your facebookpage but beyond the beyond is Angela Merkels page. Wanted to express my gratitude to a politician who is standing for the refugees from Afghanistan (they are being sent back now) but it ist not possible to reply on his page. Then I went to Angela Merkel because she has been criticising him about this matter. And than I read the comments….. 99% of the comments are full of disregard, mockery and hate. Why is facebook often like this? Are they all real people or just payed trolls? It made me curious. Is this a common thing in Europe? I searched for the page of the dutch prime minister Rutte. Seems quite normal. Maybe Holland is not so important and there are no payed trolls? Or someone is cleaning up the page all the time? “Do Something” has been one of my mantras since 9/11. I just saw a documentary on brain plasticity and it explained WHY and WHAT we think will change our brains. There are only two emotions: LOVE and FEAR. All positive emotions come from love, All negative emotions from fear. From love flows happiness, contentment, peace, and joy. From fear comes anger, hate, anxiety and guilt. It’s true that there are only two primary emotions, love and fear. But it’s more accurate to say that there is only love or fear, for we cannot feel these two emotions together, at exactly the same time. If we’re in fear, we are not in a place of love. When we’re in a place of love, we cannot be in a place of fear. Dear E, and guess else grows out of love? DEMOCRACY. The cornerstone of true Democracy is love. 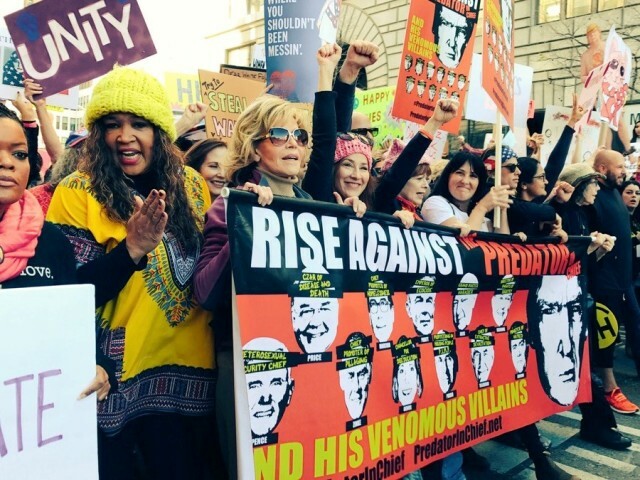 Now that Trump has bullied the Army to grant the final permit needed to complete the Dakota Access Pipeline, a Native Nations March on Washington has been planned for March 10, led by the Standing Rock Sioux and I imagine/hope/pray Jane Fonda will be in full frontal view along with multitudes! Trump’s DISRESPECT of women, Mother Nature and the indigenous Americans could be the spark that ignites the 2nd American Revolution and ground zero is Standing Rock. Eileen, There will be a parallel march in support of No DAPL in Los Angeles on March 10th From 11am to 5pm starting at Pershing Square, just like the Women’s L.A. march. I start shooting March 6th but I will try to get the production to let me off to attend. Jane, what will you be shooting? Can you tell? 🙂 G&F Season 4?! This is great! and Season 3 is just around the corner… can’t wait! O Jane, I am waiting to read somehing uplifting from you. Betsy DeVos “in”, Elizabeth Warren silenced, green light for the Dakota pipeline. In the Netherlands the election forecast says the rascist party with no other programm than being anti-islam, will become most votes. Maybe I should watch Grace and Frankie episode 13 where Grace and Frankie are so victorious. I have seen season one and two about 10 times. Time for a new season? Thanks, Ama. Season 3 starts streaming March 24th. I am so busy, like so many, speaking, organizing meetings, talking to activists…developing strategy. Stay tuned. Dear Jane, thanks for answering. Grace and Frankie S2 episode 13 really made my day again. Made me laugh and gave me new strength. I hope season 3 will be as good and uplifting as season 2. Anne Moll (the german Grace) writes the job was fun again so it will be great. No doubt. Keep safe!